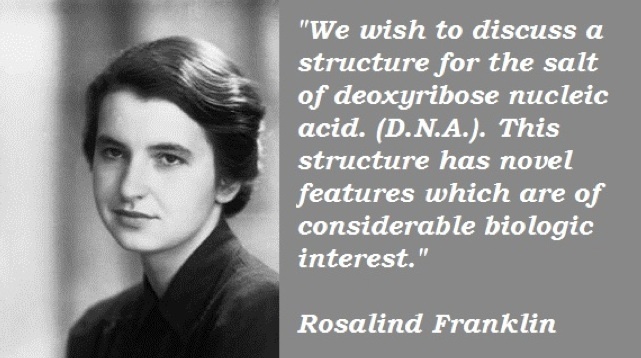 Geek out with Rosalind Franklin, DNA, The Brain, and Queens. Hope you have all had a great week. As you know I made a commitment to make sure I wrote a post every Friday and today I must say I almost missed it but for good reason; it is my younger brothers birthday today and we spent most of the day playing Aunty and Uncle at the London Aquarium with our niece. Much fun was had and here I am at 9.42pm on a Friday evening, working on this post making sure I fulfil my commitment to you all. I can’t help but geek out over and share with you one of my personal female role models in the world of genetics, and I am not alone; you may have noticed the google doodle tribute below on your home-screen yesterday. 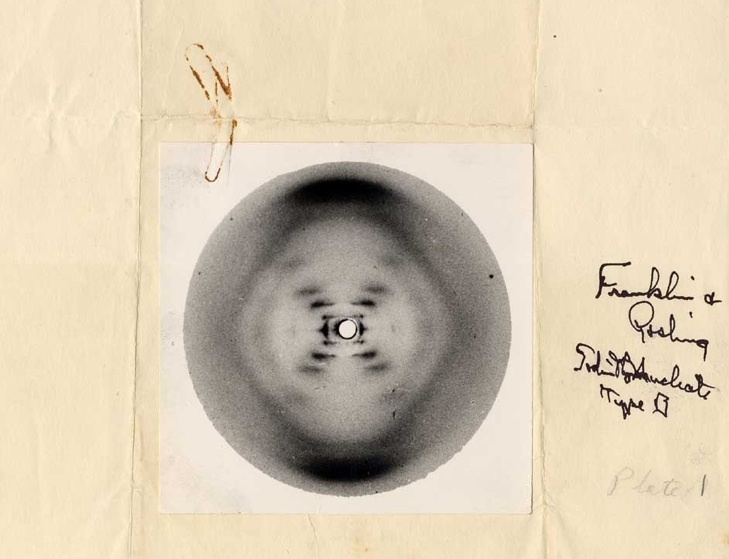 This is becasue it is the 60th Anniversary of Rosalind Franklin’s discovery at our very own Kings College London of the structure of DNA through X-ray images, the famous Photo 51. Yes, I said famous, and it is deserving of the word and you are about to learn why. The images above and below denote one of the 20th century’s biggest scientific breakthroughs, and Rosalind Franklin is being celebrated for this contribution this weekend. Franklin’s Photo 51 below was one of the biggest contributing factors to helping us unlock the secret of DNA, even though she famously failed to share the Nobel Prize awarded to Francis Crick and James Watson for the work they admitted was built on her investigations. In-fact, it was “rumoured” that Franklin’s supervisor shared several of her images, including “Photo 51”, with James Watson without her knowledge or consent. Up until the time when they saw this particular image, Watson and Crick, had wrongly postulated that the DNA “backbone” was on the inside of the molecule. Her image pointed out their error in logic and they quickly revised their hypothesis and published it, which then led to them being awarded the Nobel Prize a few years later. She got side-lined but this weekend she is being celebrated and recognised for her good work and efforts. Hard work always pays off in the end. The Guardian wrote up a brilliant article about her devotion to science research and her inspirational and pioneering career. She was finally recognised by the 1962 Nobel Prize in Physiology or Medicine four years after her tragic death from ovarian cancer. Tomorrow, Kings College is providing a free family open day at the University’s Cultural Institute at the East Wing of Somerset house. Visitors will be invited to watch real human brains being examined by anatomists, and learn about the wiring of the brain (not for the squeamish and an advisory age of 12 has been given). You will get the opportunity to meet with neuroscientists and learn about the structure of DNA upfront and close. The Institute is open from 11am-5pm. It is also the last chance to visit the photographic exhibition of picture cells which of-course includes Franklin’s Photo 51. Schools are out, so this is a great opportunity for the family as a whole, aspiring medics and scientists, as well as everyday people geeks to get inspired. I was trying to think of a fitting song tribute for this lady and as she is literally the Queen of Genetics, I finally settled on this ‘Queen’ by Janelle Monae feat Erykah Badu. I love this song and video for many reasons, too many to re-count here so click play below and enjoy! This entry was posted in Geek Out and tagged #brain, #DNA, #erykahbadu, #femalescienetists, #geekout, #janellemonae, #kingscollegelondon, #queens, #rosalindfranklin, #stemettes, geek, music, sceinceeducation, science by Faith In Geeks. Bookmark the permalink. It can be in point of fact an incredible and helpful part of information. We are satisfied that you just contributed this useful details along with us. You need to keep us updated this way. Thank you for revealing. Thank you for your support. Please keep reading and sharing the information.